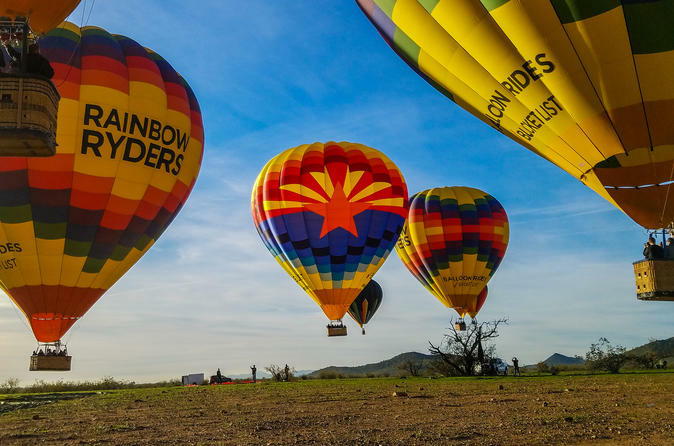 Begin your 1-hour Sonoran Desert hot-air balloon adventure at the check-in office. Meet your pilot and crew and travel together to the launch site. Help with the set up, or simply sit back and relax as the giant hot air balloon is assembled. Then gather for a quick safety briefing before climbing aboard the basket and taking off into the sky. Glide above the picturesque Sonoran Desert for an hour and watch as the area comes to life in the early morning. As your marvel at extraordinary views in all directions your pilot guides the tour and explain how far and how high you are traveling. Watch the sun wake up the desert and then slowly return back to your staring point on land. After landing you’ll be handed a celebratory champagne toast, a ballooning tradition that dates back to the 1800’s. Feast on a delicious breakfast served by the very popular local Wildflower Bread Company and claim your commemorative flight certificate. After the pilot and crew get the balloon all packed up they will take you back to the check-in point, where additional souvenirs are available for purchase.